After a first day of Speed Slalom and Pair Classic, and a second day of Freestyle Classic, the third day of the 7th WFSC was dedicated to Freestyle Battle from AM to PM. The men’s category had 50 registered skaters while the women were 18. Out of the October WSSA World Ranking Top-20, 16 men and 14 women were present: A promising cast! The firsts to open the ball the lowest and non-ranked skaters of the men’s category who were dispatched into 8 qualification groups. Only 2 groups were made of 4 candidates, the rest was lighter with only 3. Only the first ranked of each group would go to the eighth finals, i.e. out of the 26 qualification skaters, only 8 would survive. A few (obvious) Asian guesses: Kantachart Sawangsri (THA, #101) and Chinese Liao Jie (CHN, #106) and Li Yu Chen (CHN, #87) go through. Shibagaki Masayoshi (JPN, #67) and Kim Tae Bin (KOR, #128) are not qualified, their respective groups being won by Hsieh Mu Lun (TPE, #191) and Terence Cheung (SIN, #103). The last three tickets go to Latin skaters Gonzalo Cobo (ARG, #61), Victor Fialkovics (BRA, #NR) and Ricardo Batiz Lopez (MEX, #144). Here we go again for an eight-group round, but this time the real competition had started. The skaters still had only 2 runs per round to convince the judges, yet unlike for the qualifiers, there were two tickets for the next round in each group: Out of the initial 32, 16 skaters would make it to the quarter finals. Yet, none of the previously qualified skaters passed, finishing 3 or 4 of their groups. Even LIAO JIE who had the potential to make it, failed behind world leader ROMAIN LEBOIS (FRA, #1) and second-qualified DMITRY SHEVARUTIN (RUS, #19): He played himself at his own game, unable to catch up with his own execution speed. Some other serious skaters were knocked out from tricky groups. Amongst others: CARLOS NELSON (ESP, #16) didn’t survive the fight against ZHU TIAN LE (CHN, #29) and YU JIN SEONG (KOR, #4) who showed very clean performances on that round; just like LAN WANG HENG (CHN, #28) and KANTACHART SAWANGSRI who were no match against YE HAO QIN (CHN, #3) and ALEXEY TSOKOLOV (RUS, #17). KANTACHART was avenged by his little brother KANCHANOK SAWANGSRI, (THA, #12), who got the first place of his round. Let’s note the impressive team performance of the Russians who were 5 out or 6 to qualify! From this stage of both men’s and women’s competitions on, the two categories are going to alternate and evolve in parallel for each round. It was now time for the women to come into play. After a brief qualification round made of… one group of three skaters, at the outcome of which only one girl entered the competition, local CHIU YIN HSUAN (TPE, 30), the quarter finals followed. DARIA KUZNETSOVA (RUS, #1) and GUAN YU XIANG (CHN, #11) got rid of ANGELIKA PRUCNAL (POL, #9) and above mentioned qualified skater. The Polish tapped several times during her combos and the Chinese made the most of it in seizing the second place ticket. In group 2, the two Chinese supergirls FENG HUI (#5) and SU FEI QIAN (#6) fought an unreachable fight – Junior Classic World Champion Vs. Senior Classic World Champion… LIN HSIN CHIEH (TPE, #15) and BARBARA BOSSI (ITA, #16) were left behind. In the two remaining groups, Westerners KSENJIA KOMIACHUK (UKR, #7) and CHIARA LUALDI (ITA, #21) as well as Asian MENG YUN (CHN, #13) and CHANYA MONGKOLCHAREONCHOK (THA, #12) didn’t survive the round. KLAUDIA HARTMANIS (POL, #4) and ZOE GRANJON (FRA, #8) took the first places, followed by WANG DING YU XIN (CHN, #17) and MARYNA BOIKO (UKR, #2). The noose is dangerously tightening. In group 1, the French, ROMAIN LEBOIS and ALEXANDRE CLARIS (#5), teamed up to oust LORENZO GUSLANDI (ITA, 11) and YU JIN SEONG, with extremely clean performances made of mastered heavy combos. Groups 2 and 3 were the exact opposites, the first gathering three Chinese and a Russian and the second gathering three Russians and a Chinese. Those configurations had the advantage to secure at least one skater of both countries to the next round… Without much surprise, Chinese ZHANG HAO and ZHU TIAN LE (#14) took the lead of Group 2, getting rid of GUO FANG (CHN, #10) and DMITRY SHEVARUTIN, while YE HAO QIN (CHN, #3) and SERGEY TIMCHENKO (RUS, #9) outdid big brother ALEXANDER TIMCHENKO (RUS, #9) and teammate DENIS ISLAMOV (RUS, 26). In Group 4, world’s current No.3 Polish MICHAL SULINOWSKI and ALEXEY TSOKOLOV were knocked out by KANCHANOK SAWANGSRI and by junior speed slalom champion PAN YU SHUO (CHN, #39). The cleanliness of execution made the difference. 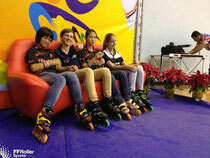 The Women’s semi finals gathered 6 skaters of the World’s Top-8 as well as World’s 11 and 17. In Semi-final 1, DARIA KUZNETSOVA and SU FEI QIAN qualified with the same types of combos and smooth execution, leaving MARYNA BOYKO a whisker away from the qualification, despite a strong and clean performance that only lacked a little diversity. WANG DING YU XIN missed too much to be considered into the equation. Semi-final 2 was also made of two Chinese and two Western skaters, and the outcome was the same: one of each side qualified. FENG HUI made quite an impression and took the lead, while GUAN YU XIANG’s performance was a bit below the general level of the group. ZOE GRANJON got the better of KLAUDIA HARTMANIS by a short head, thanks to a cleaner performance. ROMAIN LEBOIS and ZHANG HAO went through. PAN YU SHO’s 30sec combo in his last run was not enough to make it for one run and a half of misses. SERGEY TIMCHENKO’s skating was daring, creative and promising but still lacked the maturity to reach the final level. In group 2, YE HAO QIN was a cut above the rest as for the difficulty and execution of his combos. KANCHANOK SAWANGSRI got a well-deserved remaining place for the final, right under ALEXANDRE CLARIS’ nose who had good reasons to hope for it with an overall performance he had nothing to regret about. ZHU TIAN LE didn’t show himself unworthy of his presence in semi-final either, but was less clean (tapping, drifting out of the lines). The Europeans didn’t thrown in the sponge and fought for their ranking. And it was rewarding: KLAUDIA HARTMANIS got the first place of the consolation, i.e. the 5 place at the overall ranking, followed by MARYNA BOIKO. They both showed two varied and elaborated runs, and a consequent last trick, which propelled them without hesitation in front of Chinese GUAN YU XIAN and WANG DING YU XIN,who respectively finished 7 and 8 because of far lower success rates. ALEXANDRE CLARIS won the consolation with merits, with a successful performance at the image of his skating throughout the day. Russian prodigy, SERGEY TIMCHENKO, got a well-deserved overall 6th place. The quality of his two runs made up for a weaker last trick. PAN YU SHUO missed that round the same way he missed the previous one, a void first run and an almost empty second run, completed by a 20-cone seven as a last trick. He was far behind and got the overall 8th place. The 7th place went to his teammate ZHU TIAN LE. SU FEI QIAN won the battle title for the third year in a row. Her performance was the cleanest, and she was the only one to successfully complete her last trick. Her teammate FENG HUI is a frequent podium visitor. Yet, this time, with a last trick echoing her first run (toe Christie) and combos with poor and unchallenging links – ‘pausing’ doing toe wheeling while her most serious opponents would cleanly switch from one trick to the other, she finished at the foot of the women’s battle podium, at the 4th place. The second place was played between the two European. If on the first run ZOE GRANJON had the advantage, the situation was reversed little by little until the last trick, missed by the French and better succeeded by DARIA KUZNETSOVA. That ultimate trick sealed both their fates with a Russian Silver and a French Bronze medal. KANCHANOK SAWANGSRI failed at the last trick, which compromised his chances to reach the podium. He finished 4th. ROMAIN LEBOIS, the only European survivor, was not at his best for that final round, missing his combo links at the first and third runs. He owed his Bronze medal to his last run, a [ back to Christie + toe shift + squatting deckchair down and up ]. It makes two more gold medals for CHINA… And 8 places overall in the two Top-8s, that is to say the half. Let’s also note the great results of Team FRANCE who secures two Bronze medals and a win at the men’s consolation final. RUSSIA has played its cards quite right too in finishing with a silver medal in the women’s and a 6th place in the men’s. Stay tuned for the fourth and last report of that series on the 2013 WFSC!